This time around, the escalator-faller-offer wasn't a tiny wee tot, it was a fully grown man – an 18-year-old boy called Shane O'Malley from Massachusetts, no less – who had gone to a gig nearby before he started larking about on the moving escalator and promptly fell off. Amazingly, the 20 foot drop only resulted in a fractured elbow, according to his family, but he's also currently complaining of a very sore back – no surprises there then. But there's one thing we haven't told you about the incident which might explain why it happened – our boy Shane was drunk. Dead drunk. He'd been drinking so much at the concert that he doesn't even remember the incident properly, but he definitely remembers the pain, that's for sure. 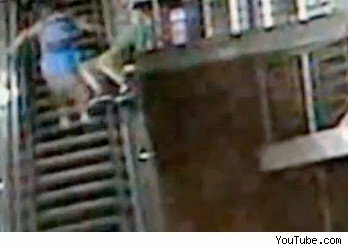 Check out the CCTV footage of the incident below, and remember kids, don't drink and ride escalators. No, wait, that's not right, we mean: always hold onto the handrail. There. A good deed done.